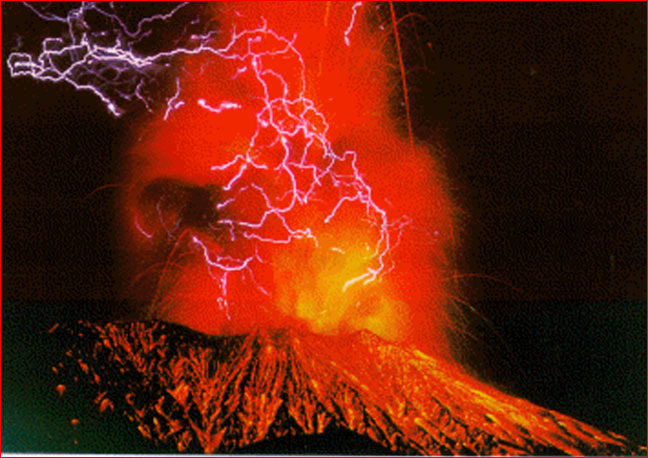 The cause of volcanic lightning is not completely understood. Geologists assume that the cause is similar to the cause of lightning in thunderstorms, which is also not completely understood. [For discussion of lightning, see TPOD Sept 17, 2004, Weather: Fair, Foul and Electric] For years, geologists have talked about charge separation caused by volcanic dust particles colliding and building up static charges. Recently a new theory has been proposed that relies on the water content of magma. From an electric universe point of view, the Earth is a small charged body moving in a large cell of plasma. Because of this, explanations of all physical phenomena in, on, and near the Earth must take the electrical behavior of plasma into account. The Physics of the Plasma Universe by Anthony Peratt describes magma as a plasma, a medium containing moving charges. So we should expect volcanoes not only to exhibit electrical behavior but to have that behavior connected with the larger plasma environment, that is, to be elements in a larger electrical circuit. But why do some volcanoes produce lightning while others don't? More curious, why do some volcanoes with large dusty plumes produce little or no lightning and others with small or mediocre plumes produce much lightning? The simple answer could be that all volcanoes are electric but that the lightning displays happen only when the resistance to the volcanic current is high. You have a good example of this in your home. The electric wires that carry the current from the wall socket to your lamp don't produce heat or light. But when that same current encounters the high resistance of a tungsten filament, it does produce heat and light. By studying the electrical component of volcanoes on Earth, plasma geologists can gather clues about the mysteries of Earth's volcanic geologic history. For example, it may help to explain why volcanism in the past -- the great basalt floods -- was hotter and more voluminous than in the present. And it may even help explain why Mars has volcanoes that are many times larger than any found on Earth today. Were Earth and Mars subjected to more powerful plasma interactions in the past?